Well (The Marriage of the Sun and Moon, Chocolate to Morphine) at his unusual and controversial best: a rigorous exploration of the broad questions raised by "alternative therapies" that opens up the whole issue of a mind-body connection and its importance in healing. The Harvard-trained physician and adept of traditional cures draws on his own experiences (as patient and physician), on medical and scientific literature, and on reports from colleagues and acquaintances to develop a new model of health and healing. In Well's view, orthodox, allopathic medicine has much to offer (it's the treatment he'd choose for severe trauma or heart attack, for instance); but it has become bound by its practitioners' efforts to make it a "real" science, like physics or chemistry. In actuality: "health and illness are. . . close to the mysteries at the heart of existence." On the other hand, traditional therapies like homeopathy, faith healing, and acupuncture (to which Well would turn first for some cancers, arthritis, and many chronic diseases), if unable to fully explain the mind-body connection, do exploit it to the fullest in healing. Well would define health as a temporary "dynamic and harmonious equilibrium of all the elements and forces making up and surrounding a human being." Perfect health, analogously, is unattainable. It is all right to be sick (anger and guilt interfere with healing); the body has innate healing abilities that can be cultivated; agents of disease--like genes--are not causes of disease (thus, possibilities for prevention increase); all illness involves both mind and body components; each body is different, and has its own weak point. 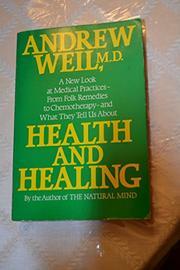 Proceeding from such new ideas, Weil examines the history and practice of allopathic medicine, osteopathy, chiropractic, naturopathy, Chinese medicine, Shamanism, mind cures, faith healing, psychic healing, holistic medicine, and quackery: what works and what doesn't in each system? what do they have in common? what does it all mean for the future? New kinds of research are needed, Well concludes, into such "anomalous occurrences," with mind-body implications, as wart cures (why does the raw potato/new moon treatment work? ), placebo responses, and spiritualists-walking-barefoot-on-hot-coals. It also behooves us to change our concept of proven: let it mean "tested"--by time, experiment, or experience--and the way will be open to the use of alternative therapies. Meanwhile, we should learn how to keep healthy most of the time and "to recognize and correct most deviations from health" without consulting orthodox or unorthodox practitioners. A sound theoretical exploration, personably set forth.